How To Get From Alicante Airport To Murcia? The city of Murcia is the second largest in the area, located about 75 km south from Alicante airport. Despite its own airport, many tourists arrive at Alicante airport since it is the airport with the most international connections along the Costa Blanca. With its growing importance, we got more and more questions on what is the best or cheapest way to get to Murcia. Considering all the different options from bus, taxi, train to transfer shuttles , we decided to put this extensive page together. Hopefully giving you a better overview on most transfer options listed by travel time , cost and convenience. How To Get To Murcia from Alicante Airport? The spanish bus Co. Alsa is running a direct bus service from the airport of Alicante to Murcia Spain. The bus stops at the Alicante airport (bus stop at Departure level!) and gets you several times during the day to the capital of the province of Murcia. Currently Alsa runs up to 8 bus services during the day (depending on the day of the week). The bus does a non stop trip and stops in Murcia at the Calle los Bolos s/n. The bus to Murcia leaves Alicante airport from the bus stop outside the departure level of the new terminal building. (This is NOT at the bus stops in the charter bus lower level -2 of the terminal building!!) . 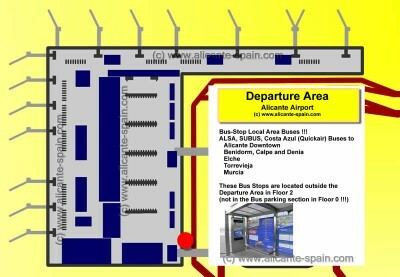 Details on where the bus stop is located, here in our Alicante Airport Bus section. 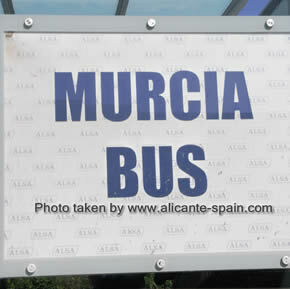 The Murcia Bus is currently priced around EUR 4,64 for a one way and EUR 8,35 for a round-trip fare. In case you arrive late and no direct bus to Murcia is running anymore, you should consider travelling to Murcia via downtown Alicante. 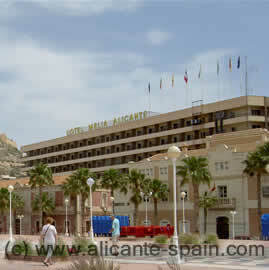 a) Take Alicante airport to Downtown Alicante bus and exit at Alicante’s downtown bus station. b) Get on a bus from Alicante to Murcia. Alsa (spanish bus company) is offering several daily bus lines. Approx. Cost of both bus tickets – one way is EUR 9, with a travel time of around 2 hours (considering some waiting time). Especially if you arrive late night at Alicante airport, the use of a late night train from downtown’s Alicante train station might be your last option of cheap public transportation. a) Take the bus from Alicante airport to them main railroad station in downtown Alicante. The Alicante airport bus to downtown Alicante gets you right to the train station. Depending on train ticket ( economy or first class ) the total trip will cost you around EUR 20 – 25 . An alternative way, of course not cheap, but if you are travelling as group or arriving at the airport when no bus is running anymore, a taxi to Murcia from Alicante airport might be the best choice. Price for a taxi to Murcia is around 85 EUR. Depending on traffic and where exactly in Murcia you are heading to, travel time is around 1 hour. A variety of companies offer private bus shuttle services from Alicante airport to Murcia. Companies like shuttledirect and Resorthoppa pick you up at the airport and get you to Murcia or even to your final resort. Definitely worth checking out beforehand, might be a valuable alternative especially when you are travelling as a family or in a group. Out of all ways to get from the airport to Murcia, hiring a car is certainly the most expensive. However if you consider the benefits of having full mobility around the Costa Calida and Costa Blanca while you are on vacation, it might be worth looking into. Especially if your hotel is located a bit off main public transportation or if you are travelling as a family with children, having a car available whenever you need it, might be a good investment for your sunny Spain holiday. >> See more on how to rent a car at Alicante airport here. As always, if you come across an alternative or cheaper way to travel from Alicante airport to Murcia, please drop us a line in the comments section below, so we can add it here.